Stencil Maker - Guger Industries Co., Ltd.
Guger Industries Co., Ltd. is a good and professional manufacturer of Stencil Maker products. We provide high quality and compatible Stencil Maker products for different requests and wishes from clients. We are not only offering good Stencil Maker products but also offering screen printers, pad printers, hot stamping and screen printers equipment. Our excellent supply of world-class quality and manufacture are based on modern facilities and quality control for Stencil Maker products. As we know, there are many Stencil Maker manufacturers are all over the world and are always in full swing in the markets. But we are very proud of our product qualities and we do believe that we can provide the best service. We, Guger Industries Co., Ltd., are fulled of technical experiences and very well known on the Stencil Maker markets. We are offering good Stencil Maker product services with qualities and have modern facilities and quality control for Stencil Maker process as, even better, other Stencil Maker manufacturers. Therefore, Guger Industries Co., Ltd. will be a good manufacturing partner as your need. Stencil Maker with Vacuum Printing Frame. 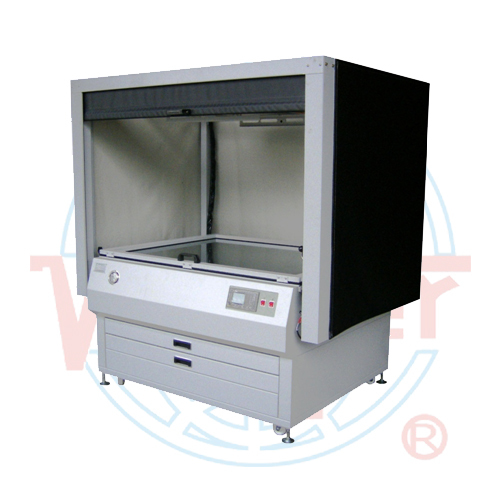 Stencil Maker WE-9120-A is Germany-made with low noise, non pollution, and the stencil maker has a high speed vacuum pump. Relative products: Screen Printers, Pad Printers, Hot Stamping, Screen Printers Equipment, Stencil Maker and more. 3KW / 6KW high power standard wave length instant lighting type light source. Germany-made low-noise, non-pollution, high speed vacuum pump. Vacuum suction board of high tension, non shape change & anti UV light. Fully automatic suction & exposure control. Indirect plate, direct plate, direct-indirect plate...etc, multiple use function.